That's another scrum penalty for Toulouse -McAlister kicks Toulouse well into the Munster half. Paul O'Connell steals the lineout but Yacouba Camara comes through and wins the ball back for the visitors. the ball goes wide and Felix Jones puts in a great tackle on Maxime Médard. Both of them are down injured but look okay. McAlister's tries a cross-kick for Gear to chase but it's a bit too hard for him to take and he spills it into touch - Earls looked like he had that well covered too. O'Connell is dominant in the air as Munster try and set up another driving maul from the lineout. A clever box kick from Murray sees Hosea Gear knock it on and Munster have a scrum. Words of wisdom from referee Nigel Owens to the front rows: "If you don't like to scrummage then you are in the wrong positions.Sort it out." Heading into the final minute and Munster win a penalty - they opt to kick for the corner and get a driving maul going from the lineout. It's a superb effort as they move well into the 22. The ball goes out and Casey Laulala tries to get an ambitious pass out of the tackle to Felix Jones who knocks it on. What a half that was! Munster will have the wind in the next 40 minutes and will hope that Toulouse keep on making unforced errors. [willgreenwood] "Munster;s intensity in defence is something that works so well for them, but if they do not go as one and if they leave doglegs then it could come back and bite them!" We are back for the second half - no changes have been made on either side as Keatley gets us underway! Ian Keatley gets the second half under way! [try] Munster have started the second half like they started the first! A superb driving maul sets them up nicely - Conor Murray looks like he is over but it's loosehead prop Dave Kilcoyne who get Munster's second try! Keatley adds the extras. Munster wina penalty at the scrum - Conor Murray threatens to tap and go but is calmed down and Keatley steps up and slots it comfortably. Earls shows exceptional pace as he chases his own kick but Yacouba Camara just gets there before him. Toulouse try and be too clever from that 22 drop out and Munster have plenty of numbers outwide - it's Casey Laulala who goes over. Keatley misses the conversion but it looks like it is Munster heading to the semis! This was one of those days where everything went well for us and everything came off. We got off to a good start and we were disciplined for the rest of the game. It was a brilliant performance from everyone - we lost peter [O'Mahoy] early on but it was a great day. I just thought I had big boots to fill. But in a game like this the support is so great and they lift you on the pitch. We had our game plan and we stuck to that. Our defence really helped us until the end. He is everything you want when you sign a foreign player. He has stuck in the middle of all the jokes, he sits in the back of the bus and he is just an incredible guy. he has has a lot of disappointment with selection through the year but he still bounces into training and is the life and the soul of the party, we are very lucky to have him. For him to come off the bench and be the man of the match is incredible. [betting]Next up it's Clermont v Leicester, and the French side are the big favourites with the bookmakers, with Sky Bet offering 5/1 on a win for the Tigers. Bet on the Heineken Cup here. I was nervous coming into this game but this is just huge. Toulouse were just ambushed by Munster. the relentless intensity was the key for me today. Toulouse never threatened - they never really built pressure. Next up is Leicester unenviable task of going to Stade Marcel Michelin to take on Clermont Auvergne who have not lost at home in 74 games. Can Richard Cockerill's men end this unbelievable run? [betting]Who will grab the first try in Clermont v Leicester then? 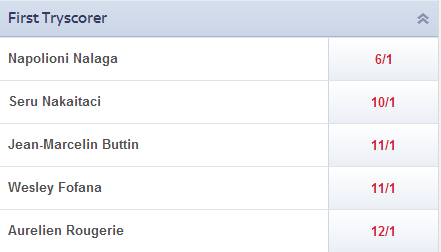 Here's the first five favourites according to Sky Bet's odds. Bet here. When you go to somewhere like Clermont it is all about belief. that starts in training - Leicesetr on the road always put up a big fight. they will be confident that they can go and put a l;ot of pressure on Clermont and see if they crack. I don't think they will, but who knows! Owen Williams kicks us off - Parra takes the ball and Brock James hoofs the ball down the line. Mathew Tait picks it up and looks to grubber it through - a bit too much on it though as the adrenalin flows. That is a rock solid scrum from Clermont and James finds a beautiful touch. Leicester lose the lineout and their is huge pressure on Leicester. hang on, the assistant referee steps in and says Leicester lost the lineout because of some interference! A good kick from Ben Youngs puts Jean-Marcellin Buttin under pressure in his own 22 - ref claims a knock on though and it's a scrum to Clermont. Chance for Leicester as they turn the ball over - for a moment they had an overlap on the outside with Goneva but Tuilagi looks for Tait on the inside. Clermont win the ball at the breakdown and Fofana breaks! Not sure he could believe how it opened up for him. Clermont trying to build something but some great defence from Leicester - especially Tuilagi who is not afraid to get stuck in. Aurelien Rougerie puts in a great tackle on Manu Tuilagi and wins the penalty after Tuilagi is penalised for holding onto the ball. Ed Slater does great work to steal a Clermont lineout - Jordan Cranme tidies up but Clermont pile on the pressure and win a scrum. Clermont bring their big men into action to get some great momentum and they win a penalty. Parra opens up the scoring for the home side. Leicester are penalised for slowing the ball down and are warned about the amount of penalties they are giving away - meanwhile Parra slots his fourth penalty of the game. Clermont are well in the driving seat but Leicester still have a glimmer of hope thanks to that Jordan Crane try. 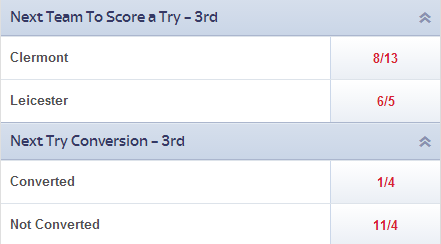 [betting]How crucial could the next try be then? 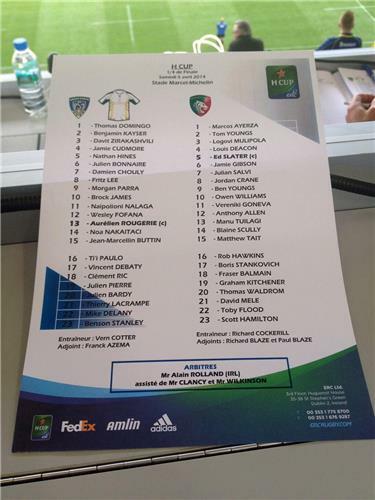 Clermont are odds-on to get it and convert, though Leicester's need is much greater. Bet in-play here. A nice break from Goneva which is carried on by Allen. This is good work from Leicester - Tuilagi tries to get down the right hand touch line but Nalaga is more than a match for him in the power stakes and bundles him into touch. Clermont win the lineout and rumble up field through a very impressive driving maul. 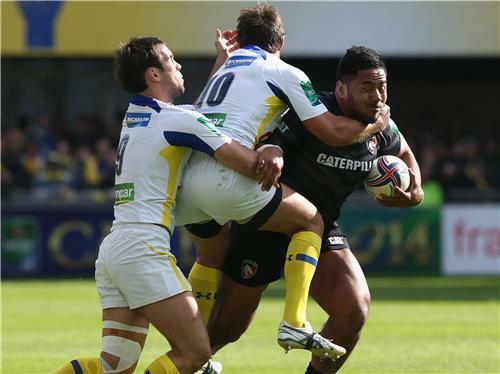 Clermont win the penalty - Rolland warns Leicester that one more infringement and they will see yellow. James steps up but hooks it left! Blaine Scully does superbly well in the air to take a Owen Williams cross kick - and wins a penalty for Leicester. Williams makes this a three point game! With 20, minutes to go this is still anyone's game - who will hold their nerve?